I love the body language “science”. It is worldwide accepted it represents about 55% of our communication language. Our silence is more loudly than our words! There are several positions of the body from what we can infer with some confidence the intentions of a person. For instance, the direction of the feet is one of the most honest parts of our body. They always point our intentions. If someone is talking to you, but his/her feet is pointing in another direction, to the door, for example, you know your conversation should end. Or you want to participate in a conversation between a group of people, and start a talk but no one directs to you, they are just listening but they are not inviting you to the group. This is not infallible science, but most of the body language is spontaneous and automatic, so, when we do it is most certainly sincere unless you practice to control it. LinkedIn has a lot of posts from human resources companies, where we can observe a lot of professional photos where people stand with crossed arms. I am not a specialist in body language, but from what I know about the subject, this position is associated with a barrier, where the person closes the contact, she/he says is not open to you, she/he is not invite you. Remember the kids, they always cross their arms when they want to silently saying “I don’t want to talk to anyone and don’t anyone near me!”. I wanted to be sure of this, so I searched more specialized places about professional image related to body language.I was right, this position IS the position to avoid in professional photos. This position indicates closed defensive shield, sometimes anxiety, like you have something to hide, is it sometimes called negative body language. One of the main tasks of sales people is when a potential client has the arms crossed, giving him an object as a gift so he could be “open” to the talk. 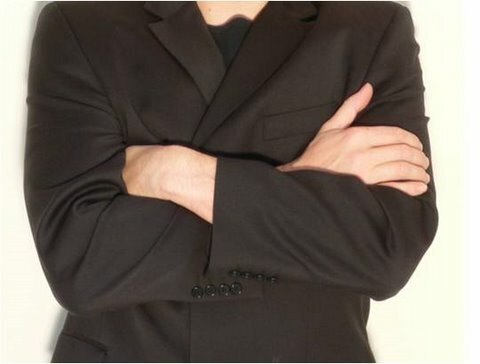 You can try a more professional position, with a picture where the arms don’t appear on the photo, or if they appear, you should try to show them doing something related to work, like pointing to a board, writing, etc. If you belong to human resources you should be aware of this. I think it is not the message you want to pass.